UKUNSIGNED SONGWRITER IS BACK ! Yep .. UKUNSIGNED SONGWRITER 2017 Begins !! Brainchild of Songwriting Academy Principal and Mentor Martin Sutton.. the 2016 Competition was swamped with entries from Songwriters of all genres competing for the Title of UKUNSIGNED SONGWRITER – and the Grand Prize which included equipment from Sponsor Yamaha and National airplay in the Coffee Shops of Sponsor Caffe NERO .. topped off with a 12MONTH SONGWRITING ACADEMY PLATINUM MEMBERSHIP (bootcamp , writing retreat in Spain, Music Industry Mentors, critique, collaborations and more) . 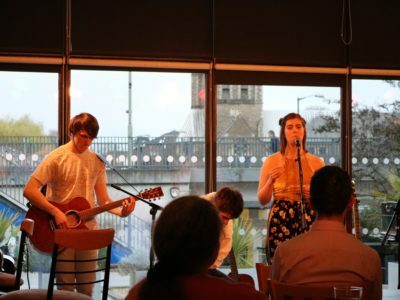 THE 2016 COMPETITION was judged by music industry Big Name Songwriters Managers and Mentors at Caffe NERO Live Venue heats across the UK and saw the emergence of the very #AWESOME Gracie Falls .. who is having an #AMAZING 12months of musical exposure including a SPOTLIGHT Guest appearance at last Winter’s TSA ANNUAL SONGWRITER CONFERENCE in London . .. and Emma Ballantine .. who has recently knocked Ed Sheeran off the top spot of the itunes singer songwriter charts to hit the number one spot with her EP SOMEVODY’S STORY. The Story continues .. We have a WINNER!